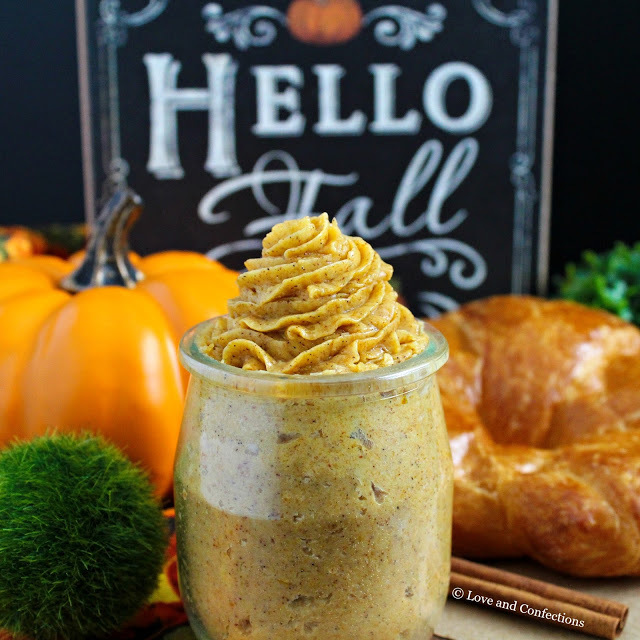 Whipped Pumpkin Pie Honey Butter is full of Fall flavors and the perfect compliment to your baked goods. Pumpkin Pie Honey butter is my Fall morning ritual. It’s delicious on bagels, waffles, pancakes, croissants, toast, biscuits, and just about any breakfast carb you can think of. It’s not just for breakfast though. 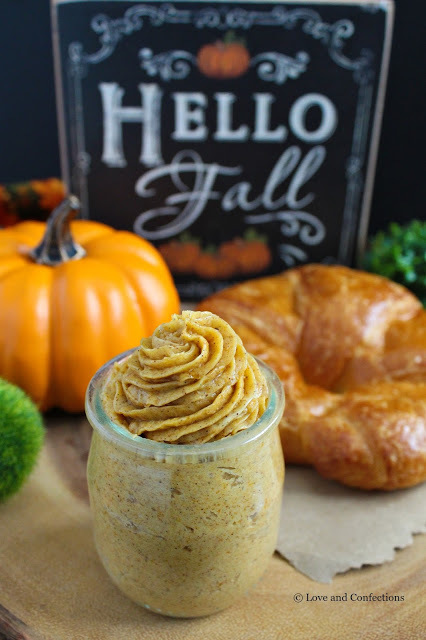 You can add this pumpkin pie honey butter to sweet potatoes or warm rolls at dinner, or scones as an afternoon snack with tea… we love tea parties here. While in culinary school, the pastry students worked in a kitchen that connected to the culinary students’ kitchen, so we were always near each other, assisting, and tasting everyone’s recipes. The culinary students were required to take an intro pastry class so they could learn the basics of baking. Near the middle of the semester, we finished early and were watching their class make an apple dessert. One guy was hand whipping cream to top his dessert. He kept whipping and whipping and whipping… and whipping. Turns out, he didn’t know when to stop and by the time he was done, had hand whipped homemade butter – and was incredibly sore. Hand whipping butter is tiring, but if you have a stand mixer or food processor, then it’s a piece of cake. He was about to throw it away when my class snatched it up and made some cinnamon honey butter for our freshly made croissants. He definitely learned a lesson that day, and payed attention to his whipping cream the rest of the semester. Everyone loved our compound butter, especially on the warm croissants. 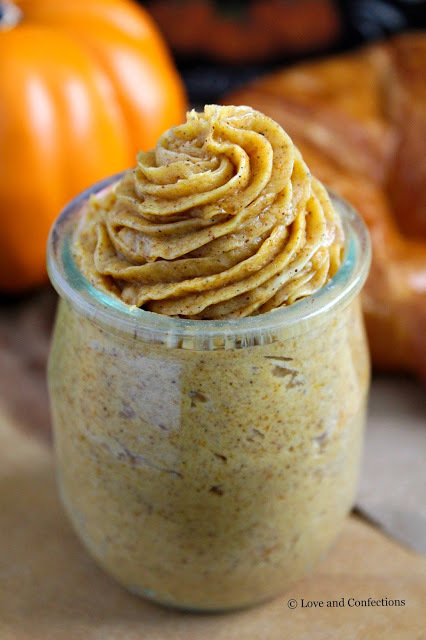 My pumpkin pie honey butter is easy to make, especially since we aren’t making the butter ourselves. You can use homemade butter, but I’m all about easy, fast and clean when I have a three year old running around me while I’m in the kitchen. This recipe doesn’t make a large amount, but is perfect for my size family. If making it for a party or holiday, I recommend doubling the recipe. This would be so delicious on your Thanksgiving table next to some warm rolls or cornbread! My mouth is watering just thinking about it! In a small bowl, combine all ingredients and whip until incorporated. Store in airtight container in refrigerator for up to one week. Oh my goodness, I want to put that on all the things! It looks absolutely delicious! Love this Fall take on Honey Butter. Thanks for such a fun week, Terri. This is amazing. Plus, great minds think alike. 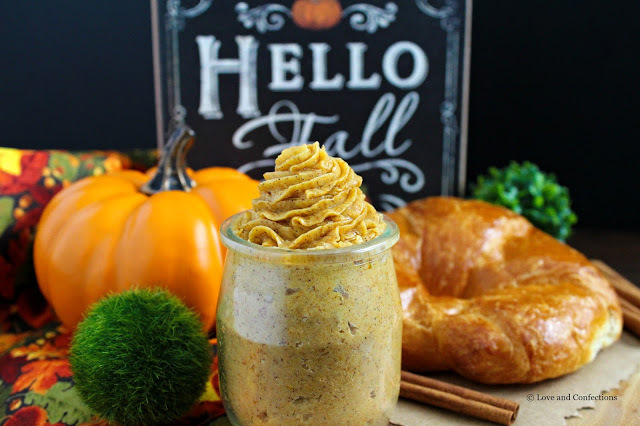 While working on another recipe for our fun #PumpkinWeek, I decided to whip up a batch of Pumpkin Pie butter – haven't posted it yet but omg it was so good. I didn't use honey and I bet that'd take it to the next level. This looks AMAZING!! I want this so bad! It looks fantastic and the vanilla bean paste is over the top yum in here!